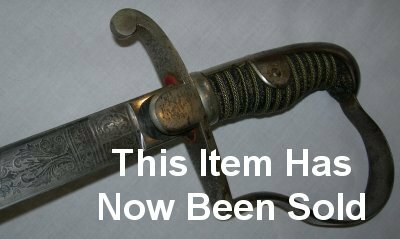 Good condition nicely etched Model 1858 Imperial German (Standard) Artillery Officer's Sabre and Scabbard. Stamped to makers WK & C (Weyersberg, Kirschbaum & Co) on the ricasso and owner's name "W Schulz" to the cross guard, this 1858 model German officer's sabre / sword along with its scabbard are in good condition. The 87 cm blade with a slightly blunted point and grip are all firm. The blade spine with the tell tale quality "herringbone" style engraving. Nicely etched with lances and canons which indicates I believe this belonged to a mounted artillery guard officer.